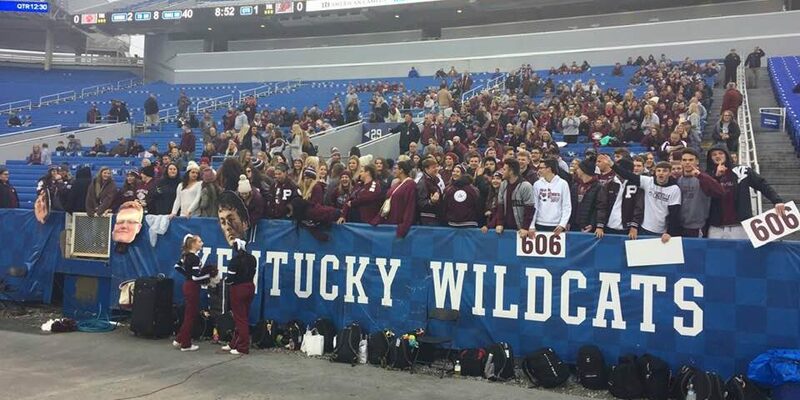 It is with a heavy heart KPGFootball publishes this last and 15th edition of this series of articles chronicling the 2018 Pikeville Football season. 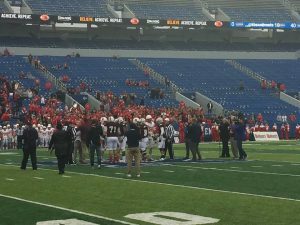 Two 11-2 football teams took the field yesterday with only one State Football Championship available for the 1A classification. That fact would prove quite sad. At the end of a game; a game which would resembled, more closely, a heavyweight title fight between very equally yoked opponents even more so than a high school football contest, there had to be a Champion and there had to be a Runner-up. For those of us in attendance, that moment of discernment would take the entirety of the allotted time before it would appear to us which one would be which. There are so many profound axioms which presently occur to me to be relevant as my mind searches for the perfect words. Perhaps one of the most oft-used of which is football is a game of inches. Whether or not that is true of all football games, it certainly was true of this particular one. Beechwood came into the game, as we published in the Special Championship Edition of Hail Pikeville having run for 3,058 yards and having passed for 1,635 yards for a run/pass ratio of 65%/35%. It would not be the passing of Cameron Hergott, the transfer from Fort Thomas Highlands, which would persistently plague the Pikeville defensive efforts on the day; but rather, a part of his duel-threat arsenal which, coming in to the game, KPGFootball had discounted. Sure, Hergott had carried the football 69 times, entering the Championship, for 442 yards rushing and 6 rushing TDs; but it was his aerial attack, his nearly 61% completion percentage, and 1,600 yards passing with 22 aerial, TD strikes, which appeared to draw the bulk of the defensive game-planing and attention from us. In the end, Hergott’s running ability, with some timely passing, but mostly his ability to run the football, would prove to be the winning margin as Hergott was selected the game’s MVP. Pikeville’s Connor Roberts and what may be the best WR KPGFootball saw play this season, regardless of classification, Jackson Hensley, nearly co-authored quite a different story, with a little help from senior WR, Christian Billiter. Hensley caught and ran in a TD from 57 yards, streaking down the field, in the first half for the Pikeville’s initial score and then Hensley made a brilliant reception down the sideline of a perfectly thrown Roberts pass to stake the Panthers to a 18-14 lead in the third quarter, before Connor Roberts play-faked and booted out the back-side and into the end zone for an important 2-point conversion to make the lead 20-14. 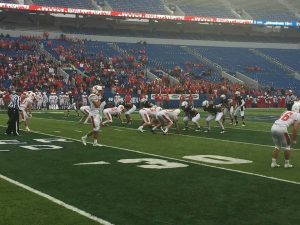 Beechwood would be the beneficiary of a long kick-off return with additional penalty yardage added to the end to begin its immediately post-Pikeville-score possession at Pikeville’s 45 yard line. The Tigers would drive the short field, stick it in the end zone, and go into the 4th quarter with a slim 21-20 lead. Down 21-20 late in the game, Pikeville got what appeared to be the break it so desperately needed when game MVP Cameron Hergott fumbled, nearly morphing from hero to goat, with Pikeville recovering. The Panthers were left with approximately 70 yards and some 3 or so minutes with which to advance the football toward a possible 5th State Football Championship. On fourth and long, and by long we mean between 17 yards for a first down, Roberts found Christian Billiter down the right sideline for 40 yards. Billiter went up and took the ball away from two Beechwood defenders both of whom were in letter-perfect, defensive position. This would set Pikeville up with 45 or so remaining yards to score the go ahead TD and probably 30 or so yards to give Tanner Hamilton a chance to win it with a field goal at the end. Roberts rolled left and hit a wide open receiver to get the ball down to the 25 yard line and imminently closer to the before stated goals. After being sacked by Beechwood’s Luke Bolger, and calling timeout, Connor Roberts dropped back a second time, under the heavy, back-side rush of Beechwood’s Luke Bolger again, and barely got the final pass away. His affected throw was intended for Billiter, who was, like before, double covered by two Beechwood defenders whom had Christian blanketed. Had the ball flown 6 more inches, Billiter may have come down with it as he had the first time. Had Roberts had another instant to set his feet and transfer his weight into the down field throw, he may have gotten the other six inches of requisite height needed for Billiter to, once more, out-athlete the two defenders to the football. Had the defender who intercepted the ball, dropped it instead, giving Roberts and the gang another play, another opportunity… had any of these things happened, we might well be authoring a completely different story today. However, like we said in the beginning, football is a game of inches. So here the Panther faithful sit, full of regret, full of what-ifs, full of should-ofs, full of could-ofs. As we reflect, it shouldn’t be lost on anyone the extraordinary season 2018 was to be a Panther. 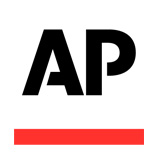 In the end, the best two teams in the classification, the two teams we voted one and two in every AP poll, the only two teams who were simply too much for everyone else in Kentucky’s 1A but the other, had to play for it all. From the Panther perspective, the good guys came up just short, by one point, by just a few inches. Looking forward, there is so much about which to be both positive and hopeful. Will the Panthers miss stars the ilk of Connor Roberts, Zack Roberts, Connor Wright, Kyle Watkins, Christian Billiter, and Bradyn The Bull Hunter? No doubt. Both these and the other seniors, and all of their combined efforts, were efforts we were proud to witness. All of their combined efforts were for the glory of the alma mater they so loved and cherished throughout their prep careers. All of their accomplishments will live on, forever, in the fabric of this proud program’s lore. There is a lot to which to look forward. 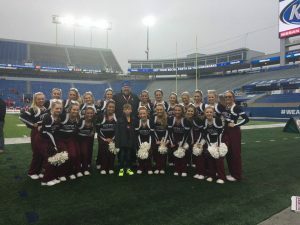 Pikeville will have a sophomore QB take the reigns in Isaac MacNamee, which KPGFootball has ranked the top player in Kentucky’s class of 2022. Carson Wright and an eighth grade football team full of quality depth, and for some, first string players, enroll in ninth grade after losing the KYMSFA State Championship game to Meece Middle School. Top-flight LB, Jon Collum, is back and so is Jackson Hensley. The team has unparalleled facilities, amenities, and a culture accustomed to playing football at the classification’s highest level. The team has the love and support of its student body, community, faculty, administration, and the mountains. 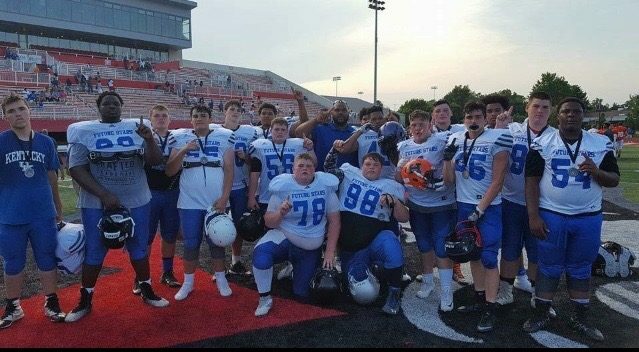 In conclusion, we thank Joe Angolia for extending KPGFootball credentials permitting our being able to be present and witness what was, truly, an extraordinary game put on by a classy organization and administrated very, very well. 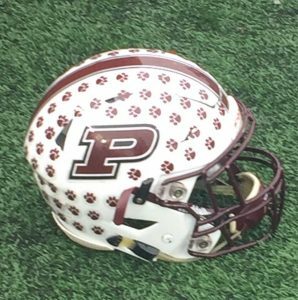 We also thank the Pikeville Panther community for allowing KPGFootball to chronicle the season, an extraordinary one at that, in our on-line magazine devoted to middle and high school football under our #WeGotUCovered program. Most importantly, we heartily voice one final Hail Pikeville as we were ennobled by getting to travel this journey with this remarkable team which, in the end, was virtually inches away from a very different outcome. We hope to see you again next year!